Soak four 10-inch bamboo skewers in water for at least 30 minutes to prevent burning. Set oven control to broil. Mix barbecue sauce, preserves and red pepper in small bowl; set aside. Wrap strip of bacon around each water chestnut. Thread shrimp and water chestnuts alternately on each bamboo skewer, leaving space between each piece. Place on rack in broiler pan. Broil kabobs with tops about 4 inches from heat 6 minutes, brushing frequently with sauce mixture. Turn kabobs; brush with sauce mixture. Broil 5 to 6 minutes longer or until shrimp are pink and firm. Discard any remaining sauce mixture. Serve kabobs with couscous. “This recipe also works great on the grill. I love grilling as a wonderful way to keep extra fat down—it’s a healthy way to cook. Plus my husband helps with the grilling.” Margot C.
Shrimp are fairly high in cholesterol, but they're low in saturated fat and total fat. You can enjoy shrimp as part of a low-fat, low-cholesterol diet—just try to watch your total cholesterol and saturated fat intake each day. 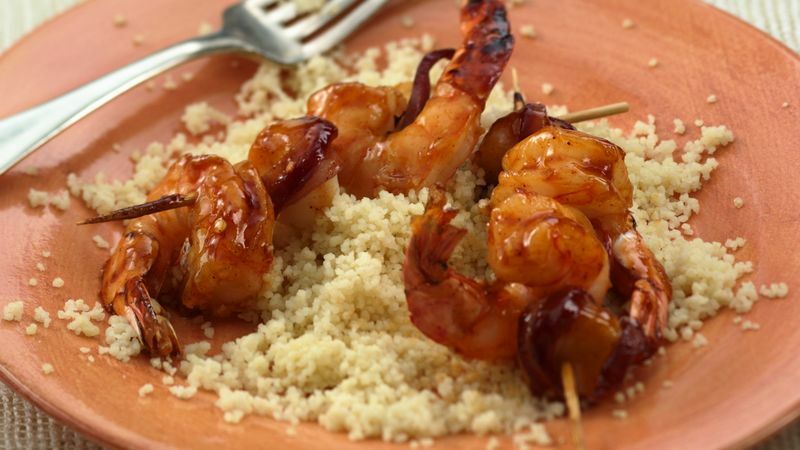 To Grill Shrimp: Heat coals or gas grill for direct heat. Follow recipe through step 3. Grill kabobs uncovered 4 to 6 inches from medium heat 6 to 8 minutes, turning frequently and brushing several times with sauce mixture, until shrimp are pink and firm.